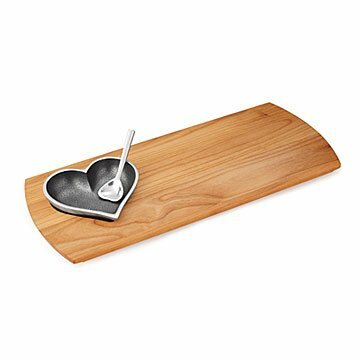 This sweet serving board is just the right size to share your favorite hors d'oeuvres. Whether your love's directed at someone special or at the cheese you're about to wolf down, show it off with this expressive two-part serving board. Made from sustainably sourced Oregon red alder, Robin Cohen's creation is just the right size to share your favorite hors d'oeuvres with a date or at an intimate gathering of friends. Sand casted, ground, and polished by hand, the accompanying heart-shaped bowl—joined by an equally sweet-looking spoon—even separates from the board for easy clean-up. Board handmade in Oregon; bowl and spoon handmade in India. "Do what you love and the rest will follow"
From the time Robin can remember, she loved drawing hearts, peace signs and smiley faces with her sisters in the Florida sunshine. After a move to Chicago and many years of fulfilling work, she started her company to continue creating and sharing all the things that she loves. Each of her products reflects her past, present and passion. "Inspired by simple everyday moments that make me smile; I hope my designs bring you smiles and inspiration too!" Hand wash bowl and board with mild soap and water. Avoid submerging board in water. When dry, help condition and preserve the board with mineral oil. The BEST wedding gift EVER ! !